My choices for the ten best birds ever seen on Monterey Bay or farther offshore and within Monterey County are outlined below. If the rarity was photographed those photos appear below. In a few cases artwork of the species is imposed over a background shot of the location where seen, in a 'collage' style. One of the most unexpected seabirds off California was Great-winged Petrel, of the race gouldi (sometimes called Gray-faced Petrel), as this New Zealand breeder is a southern hemisphere species. This one in Monterey Bay on 18 Oct 1998, 9 nmi W of Pt. Pinos, was just the second in the State and in the northern Hemisphere. [The first had been at Cordell Bank, off Pt. Reyes, on two dates in July & Aug 1996]. Two more (possibly the same bird?) were recently on the SCZ side of Monterey Bay: 18 Sep 2010 and 26 Aug 2011. 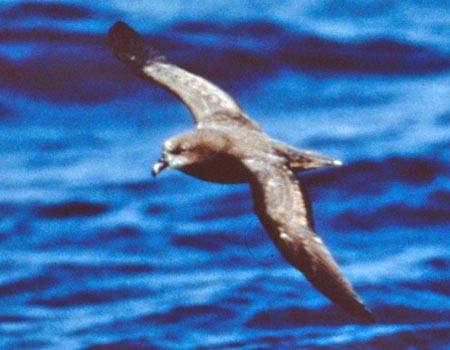 Bulwer's Petrel is a small tropical petrel across the Pacific Ocean (nearest breeding Hawaii) that also occurs in the Indian and Atlantic Oceans. The first photographed in North American was this individual on a flat calm day 16 nmi W of Pt. Pinos. A second continental photographic record came just two weeks later off North Carolina. [A prior sight record from the Salton Sea in July 1993 is believed valid by many, including me.] While Pterodroma petrels typical fly in bounding 'roller-coaster' arcs, the longish-tailed Bulwer's Petrel glides low over the surface. It presence in Monterey Bay in summer 1998 is attributable to very warm waters then present as part of a lingering 'El Niño' event that summer. The most severe 'El Niños' in the second-half of the 20th century were 1982-82 and 1997-98. 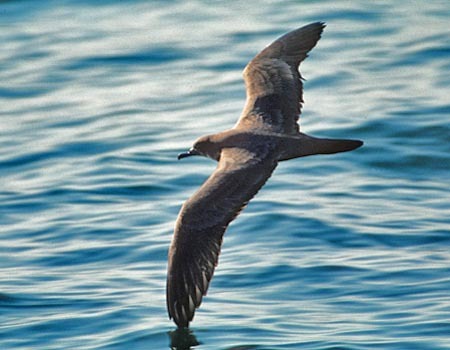 On 17 Nov 1979, 38 observers were aboard a chartered fishing boat from Morro Bay in an effort to reach offshore waters near the Davidson Seamount where in Oct 1979 seabird researchers had seen 'Cookilaria' petrels. The trip successfully found 7 small Pterodroma, including 3 that were close enough to identify at Cook's Petrel (left; the photo shows a Cook's flying away with gleaming white underparts). The 7th 'Cookilaria' was similar to Cook's below but darker above, and had a different head pattern [inset is a reproduction of Guy McCaskie's sketch]. This bird was later identified as Stejneger's Petrel — a first for California — although specimens had been taken a few hundred miles farther offshore back in 1906. Stejneger's breeds in the Juan Fernandez Is., off Chile, but migrates to the north Pacific. This one was 48 nmi SW of Pt. Sur; details in McCaskie & Roberson (1992) Western Birds 23: 145-152. Since then a Stejneger's was 30 nmi SW of Cypress Pt. 31 July 2009 (Michael Force), and a Pterodroma photographed inside Monterey Bay on 4 May 2003 might also be this species. One of the great conservation stories of the 20th century was the recovery of this spectacular, large, north Pacific albatross. Known only from a couple breeding colonies on small volcanic islands off Japan, it was once a regular visitor to Monterey Bay in the 19th century. But shooting, egg-collecting, volcanic eruptions, and war decimated populations; it was thought extinct after World War II. Slowly, a comeback is underway. One was seen off California in 1977, 3 in the 1980s, 8 in the 1990s, and 31 from 2000-2011. These have all been young birds (mostly hatch-year birds): all-dark with huge 'bubblegum-pink' bills. Some are the same individuals found miles apart, but this is still impressive. A dozen of these recent California birds have been in Monterey Bay or off the Big Sur coast. A number of them have carried bands, presumably ringed as youngsters in the Japanese breeding islands. The six Great Shearwaters so far in Monterey Bay (including one in SCZ) have occurred between October–February among flock of Sooties. The first one in Feb 1979 was controversial because of the 'wrong ocean' bias and the failure of observers to see the dark belly patch. As it turns out, the belly patch is often hard to see under field conditions — but it still worth looking for. California's first record came ashore and was picked up in a Carmel backyard on 21 Jan 1969. It proved to be race kelsalli which breeds on islets in the Peru Current (specimen at CAS). 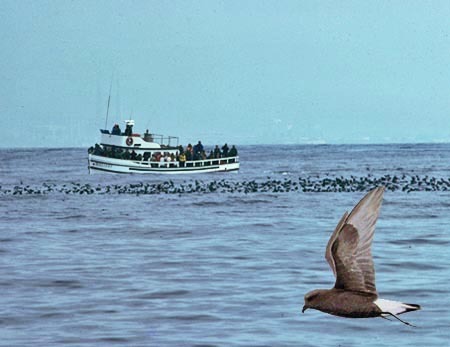 The next two birds, though, were among the famed storm-petrel flock along the north rim of Monterey Bay for a week or two in fall 1977 and fall 1983. 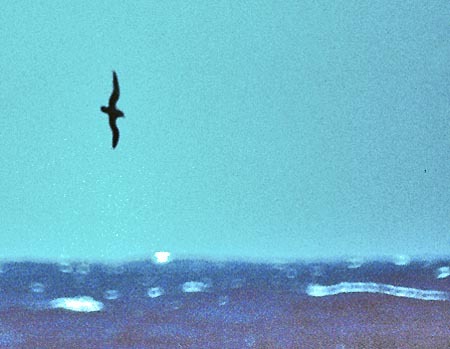 The background photo shows one of two birding boats at the storm-petrel flock on 9 Oct 1977 — a day on which the Wedge-rumped was seen. 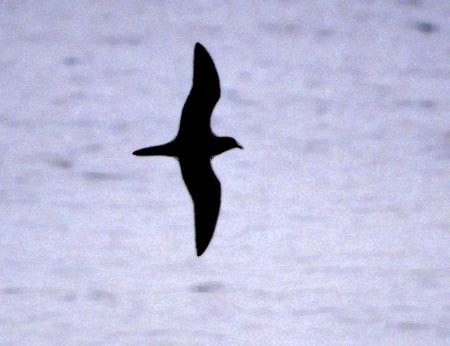 The birder searches the flocks of dark storm-petrels for 'white-rumped' storm-petrels. Wilson's is was regular in small numbers, and Leach's has occurred, but the vagrant Wedge-rumped is as good as it gets. Wedge-tailed Shearwater is a widespread procellarid of warm, tropical waters in the Pacific & Indian Oceans. Light-morph individuals predominate in the Hawaiian nesting population, but those nesting off Baja are dark-morph. 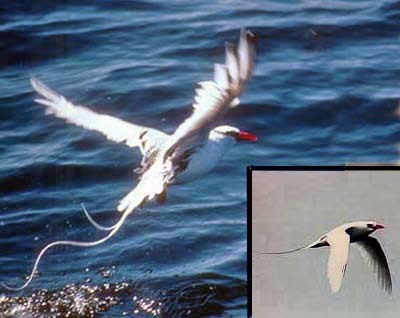 Monterey Bay is where almost all of North America's Wedge-tails have occurred. The first was 1 Apr 1915 (light-morph specimen at MVZ 91142), and light-morph wild birds were seen and photographed 31 Aug 1986 and 26 Sep 1999. [Yet another was picked up injured at Salinas on 22 Dec 2009.] 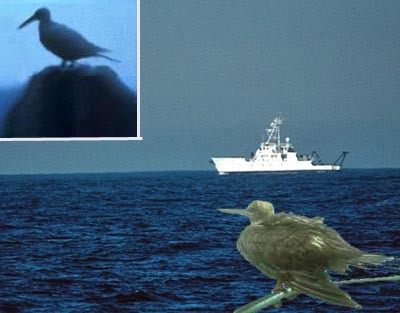 The sole dark morph bird (photo left) frequented both side of the MTY-SCZ line in Monterey Bay between 10-21 Oct 1998. All of these were 'warm water' years, and 1915, 1986, 1998, and 2009 were all officially designated as ''El Niño years." 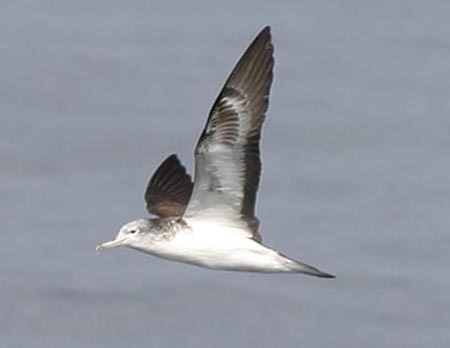 So its official — Wedge-tailed Shearwater is an El Niño shearwater! Streaked Shearwater is a bird of the western Pacific. It breeds around Japan and Korea, and migrates south towards Australia. The first for North America was collected on Monterey Bay on 3 Oct 1975, but since then a dozen more have been seen on the MTY side of Monterey Bay or off the MTY coastline: 9 Oct 1977, 14 Oct 1978, 26 Sep 1982, 22 Sep 1985, 7-29 Sep 1992, 10 Sep 1995, 6 Oct 2001, 30 Sep 2006, 15 Oct 2006, 13 Oct 2007, 14 Oct 2007, and 12 Oct 2008 (plus another on the SCZ side). Note that all these dates are between 7 Sep–15 Oct, a narrow 5–week period only. 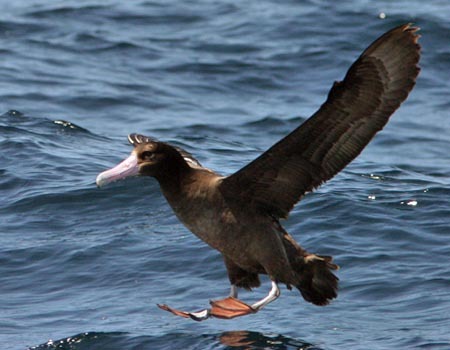 Fortunately for visitors, this date span is the prime seabirding season for Monterey Bay. 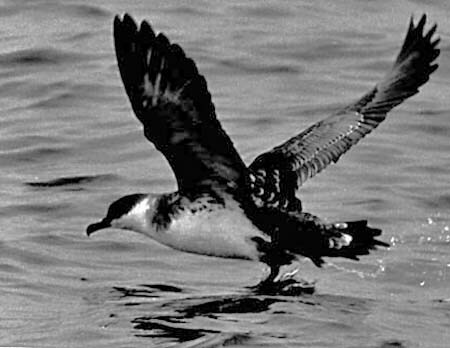 Since the first "Dark-rumped Petrel" was seen in May 1992, the CBRC has accepted 42 records of this acrobatic Pterodroma. After "Dark-rumped" was split into Hawaiian P. sandwichensis and Galapagos P. phaeopygia petrels, criteria to separate them was developed in the past decade (e.g., ). 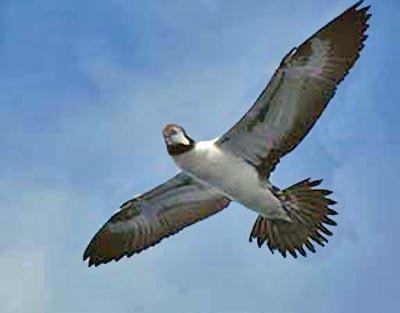 Now, CBRC has re-reviewed those with photos and accepted half (21) as Hawaiian Petrel. I have long contended that all CA records were of Hawaiian Petrel. Alas, the 3 MTY records are supported only by very distant photos (e.g., distant shot inset at left from 26 June 1994) or written details without photos: 17 Sep 2005 ~9 nmi W of Pt. Pinos, and 25 July 2010 Davidson Seamount. My sketch of the 17 Sep 2005 is also inset at left, showing the contrasting white forehead/black cap/gray nape pattern observed. The best dates appear to be May–September, and we expect more. Hawaiian Petrels followed through radio telemetry on Hawaii often head in our direction! Our understanding of the distribution of pelagic seabirds has increased dramatically within the last 3 decades or so. 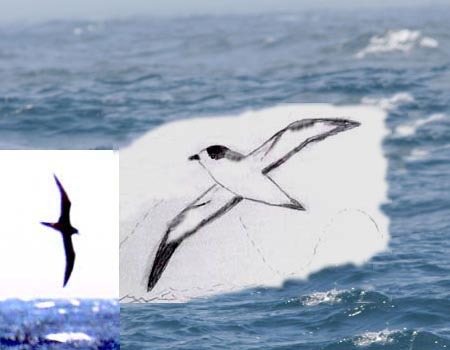 Murphy's Petrel is a good example. This little-known Pterodroma, nesting only on remote south-central Pacific islands, was once a mystery away from those breeding grounds. Now we know that Murphy's is regular far offshore California between April–June. This paradigm change came from a research cruise off Marin-Mendocino in Apr 1989 (98 birds in 2 days), and my own 'platform-of-opportunity' cruise aboard R/V Pt. Sur 7-11 Apr 1991 some 30-50 nmi offshore from Pt. Sur north to Año Nuevo. In those 5 days of rough seas and near-gale conditions, I saw 122 Murphy's in 3 counties, where it was by far the commonest bird offshore (double the counts of Black-footed Albatross or N. Fulmar). Murphy's is still a bird of far offshore reaches in the Pacific gyre — generally too far offshore for a single day's boat trip — and even then its presence and annual abundance is hit-and-miss. There is a record of one in good weather inside Monterey Bay, on the SCZ side, on 23 May 2009. Red-footed Booby is a tropical sulid found in equatorial waters. It forages far out to sea, and often rides on ships. 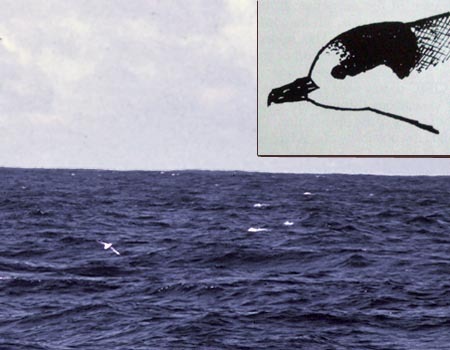 On 8 Oct 1987, John Klusmire photographed a booby riding on research vessel Pt. Sur, whose home base is Moss Landing. The booby had landed at mid-Bay and rode the ship into harbor. Klusmire's photo is on file with the CBRC I have created this collage to shows the actual RV Pt. Sur at sea on Monterey Bay, but the dark-morph Red-foot perched on a railing is actually from San Francisco Bay in Oct 1987 (so its the right ship and year but the wrong booby). 1987 was a remarkable year for Red-footed Booby, with a half-dozen reaching California. The inset shows the final booby of that invasion on 3 Dec 1987. It was first seen at Hopkins Marine Station ( correctly identified) but moved to Pt. Pinos late in the day and misidentified (poorly photo'd; inset). It was controversial and not CBRC-accepted, but I am sure it was Red-footed. 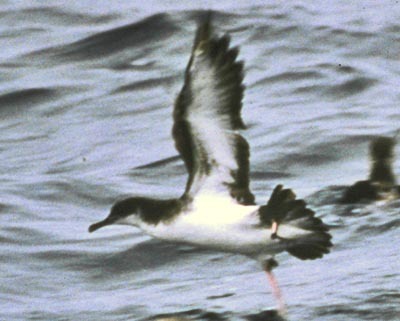 Manx Shearwater is an Atlantic shearwater, even named for the island of Manx in the Irish Sea (it breeds commonly in the British Isles), and winters in the south Atlantic. But one on Monterey Bay on 27 Aug 1977 was a precursor to a major range expansion from birds getting around the southern tip of South America and migrating north. Since the first photographically documented record on Monterey Bay 25 July 1993, over a hundred have been recorded here. It may now be breeding in Alaska or British Columbia. Manx has now occurred in every month on Monterey Bay, and some have been seen from shore. The peak migration appears to be Aug-Oct, and up to 3 have been documented from a single boat trip. It has gone from a major rarity to 'expected' annually, although numbers have tapered off in very recent years. I wrote an i.d. paper: Roberson (1995) Birding 28:18-33. When the AOU split Nazca Booby Sula granti from Masked Booby S. dactylatra, they created an unexpected identification problem. Masked Booby adults around the world have yellow bills; Nazca Booby of the Galapagos have bright orange bills. But fledglings of both species start life with gray bills, and therein lies the problem. So far, all adults and subadult boobies of this category in California have been yellow-billed Masked, but several juvenal boobies are uncertain, including two from Monterey Bay area: 5 Apr 1990 off Pt. Lobos & 13 Feb 1999 from the middle of Monterey Bay (photo right). Both birds lacked cervical collars, as is more typical of Nazca than Masked [see my article "Sulids Unmasked" (1998) North Amer. Birds (then Field Notes) 52: 276-287]. Further, juvenal Masked that lack cervical collars (only the Baja population) should not be dispersed from breeding colonies by Feb, so there is reason to believe this booby is a vagrant Nazca Booby. In 2012, the AOU split Xantus's Murrelet into two species: Scripps's Murrelet Synthliboramphus scrippsi and Guadalupe Murrelet S. hypoleucus. Scripps's is the breeding bird of California's Channel Islands, at least 220 miles from Monterey Bay. 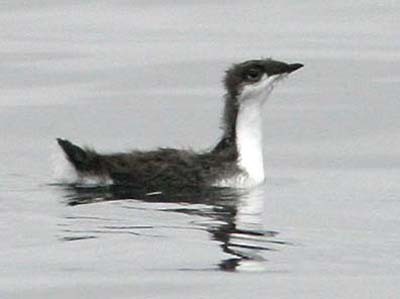 Because birders had seen apparent "father-and-chick pairs" of Scripps's Murrelet in warm water offshore in Aug-Sep, we believed those youngsters had come all that distance with a parent, but this was just hypothesis until I photographed this fledgling here on 14 Aug 2005. It still clearly has much natal down and since there are no known close breeding areas, it must have made this long distance on its own power. Very impressive indeed. Note — this is a color photo (left) but it was just a very gray day, when the water and the sky were the same color . . .
Any tropicbird is a rarity in MTY, but two species are likely regular in small numbers far offshore in 'warm water' years, or just within the warmer waters of the Pacific gyre, beyond the cold California current. Ten records of Red-billed Tropicbird are scattered between June–October, and some are not far offshore, like this one (right) just off Pt. Lobos in very warm water conditions in July 1993. There are 3 records of Red-tailed Tropicbirds, all 46-147 nmi offshore (so well out there! ), with singles for August, September & October. In short, you are really lucky to see any tropicbird offshore MTY.